Excerpted from: Pawling, J. R., M.D. "Dr. Samuel Guthrie: Discoverer of Chloroform." Watertown, NY: Brewster Press, 1947, pp 23-26. 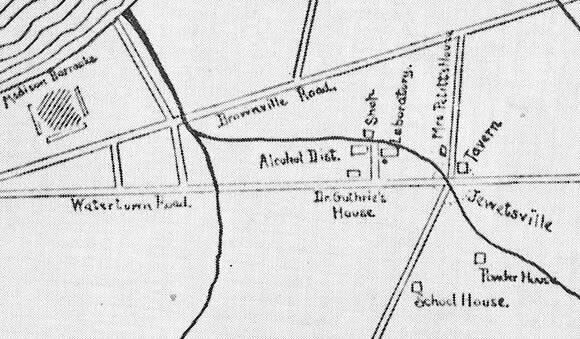 Detail from map in Ossian Guthrie's "Discovery of Chloroform" (1887). "...[Jewettsville] got its name from Abram Jewett, who came there from Watertown in 1817 to set up a brickyard; he was once asked why he had moved to Jewettsville; the reply was, "I had rather be 'King among Hogs' than 'Hog among Kings'." The hamlet enjoyed a reputation for drunkenness, profanity and breaking of the Sabbath far beyond that of neighboring communities. It manufactured its own beer and whiskey and did a lively trade with the soldiers of Madison Barracks. A settlement just to the north, that is, on the other side of the Military Road, called themselves "Mill Creek" and were quite unwilling to be classified with the inhabitants of Jewettsville, to which they applied the epithet "Sodom". 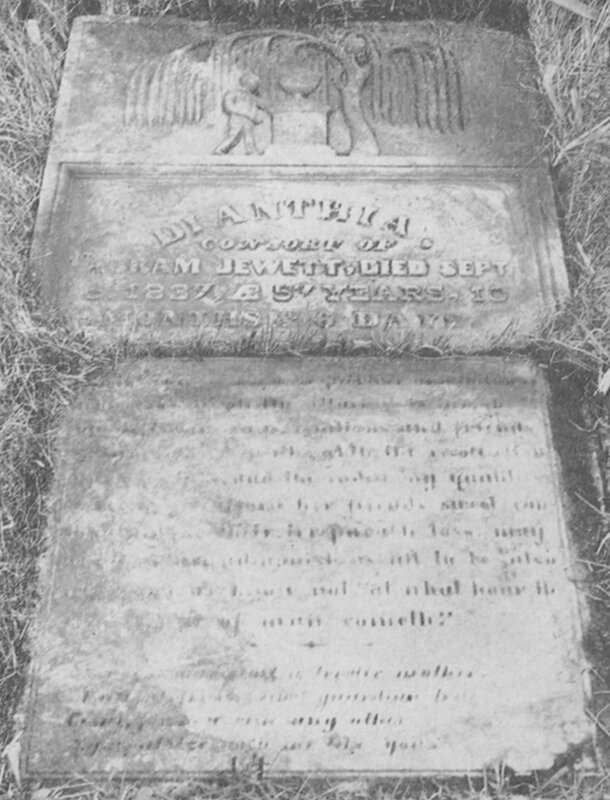 "Jedadiah Burchard, Presbyterian evangelist, held many meetings there. He was vigorous in his preaching. It is told that once, when a deacon was standing and praying, Burchard shouted, "Get down on your knees, deacon, don't stand like a flagstaff of hell." Another time he grasped a dissolute youngster by the hair, saying, "Young man, do you know you are going straight to hell?" to which the youth answered, "I guess so. The devil has me by the forelock." One evening . . . Mr. Geo. Camp was conducting a religious meeting at Jewettsville and during the services what was apparently a woman entered the room and took a seat. Mrs. Martha Pettit, who was present, exclaimed, "There is a man here disguised in women's clothing." Whereupon the suspicious form arose and made a rush for the door. In the excitement it tripped and fell prostrate on the floor. Mrs. Pettit . . . seized the falling figure, tore off the disguise and exposed to view a man named Patrick. It is said that he was instigated to the trick by "Alf" Guthrie, son of the doctor." Quote from L. L. Allen, Watertown Daily Times, April 4, 1892. Abram Jewett, in his later years, had the reputation of visiting rather too frequently the nearby tavern. He took a "short cut" through the fields from his home on the Military Road almost directly over to the Watertown-Sackets Harbor road. 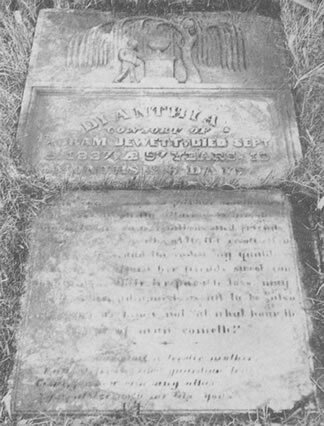 His wife, just before her death, ordered that she be buried along this well-beaten path; here her gravestone can still be found (in the rear of the buildings of the Hess farm) broken and fallen flat on the ground. Jewettsville became an important little community; in 1831, the village limits of Sackets Harbor were restricted to Mill Creek, to the east of which was Jewettsville. Beside the early sawmills, gristmills and asheries, numerous other enterprises had been set up; at the height of its activity, it comprised several brickyards, lime-kilns, cooper-shops, wheelwright and blacksmith shop, rope factory, three vinegar mills, four distilleries, malthouse, brewery, bakery, woolen mill, tannery and glove-factory. Mill Creek and its branches, in those days, had, of course, a more constant flow, when large portions of the forests had not yet been cut down. Potential water-power decreased as more and more of the densely wooded areas were cleared for cultivation. Moreover, the village of Sackets Harbor in competition with neighboring Watertown desired water-power of its own. "By the act of April 28, 1829, a tax was imposed upon real estate within the village of Sackets Harbor and on the mill-sites on Pleasant creek, amounting to $3,000 in two years, to be assessed in proportion to benefits received"—this for the purpose of constructing a canal to withdraw water from Black River at Huntingtonville (two miles southeast of Watertown). Elisha Camp undertook to carry out this project, a canal twenty feet wide at the top, twelve at the bottom and four feet deep. Its exact course cannot now be definitely determined. Signs of it can be seen just below the Watertown pumping-station at Huntingtonville and again, immediately across the road which parallels the east bank of the river. It probably followed somewhat the course of the present Watertown-Sackets Harbor Railroad along flat terrain to the "Big Swamp" (between Field's Settlement and East Hounsfield); but beyond this point it is impossible to follow with certainty; perhaps it connected with one of the branches of Mill Creek draining the Swamp and finally emptied into Black River Bay, entering the village of Sackets Harbor somewhere near the old Stone Mill. It supplied valuable waterpower; however, considerable litigation arose and there was great difficulty in maintaining the first half-mile; after ten years it was abandoned, having made no profit for its sponsors. In derision it was called "Camp's Ditch". Certainly it did Jewettsville no good since it drained some of the latter's water-power; this explains, in part, the fading of the importance of Jewettsville. Now there is nothing left to indicate the extent of this once-flourishing settlement. Near the southern border of Jewettsville was the Doctor [Samuel Guthrie]'s home and close by were his farm and his mills; and here he carried on his scientific research."